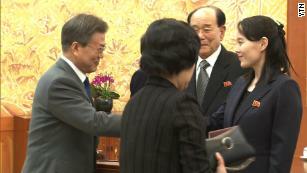 (CNN) The leaders of North and South Korea will meet on April 27 for the first time since 2007, the two countries announced Thursday after high-level talks. The landmark meeting between President Moon Jae-in and Kim Jong Un will be held at Freedom House on the southern side of the Demilitarized Zone (DMZ), according to the joint statement issued after the talks. Officials from both sides will hold working-level talks on April 4 to prepare for the meeting and agree on security and media arrangements, it added. The summit will be seen as a victory for Moon, who has long been pushing hard for diplomatic relations with North Korea. He said at his swearing-in ceremony in 2017 "for peace on the Korean Peninsula, I will do everything that I can do." The last Inter-Korean summit was held in October 2007, when then President Roh Moo-hyun met Kim's father, Kim Jong Il. South Korean Unification Minister Cho Myoung-gyon, left, shakes hands with North Korean delegation head Ri Son Gwon at Panmunjom on March 29. The confirmation of the summit is the outcome of weeks of hurried diplomacy, after a surprise thaw in relations on the Korean peninsula earlier this year. In January, the North Korean government unexpectedly resumed communications with South Korea and agreed to talks, sending a team to South Korea's Winter Olympics. When Kim's sister joined the Pyongyang delegation to the games in February, she was the first member of her family to step onto South Korean soil since the Korean War in the 1950s. It comes in sharp contrast to 2017 when the peninsula appeared to be barreling toward conflict, with Kim overseeing a string of missile and nuclear tests and Trump promising "fire and fury" as Pyongyang threatened Guam, Hawaii and even the US mainland. The Kim-Moon summit will precede a bombshell encounter between the young North Korean leader and US President Donald Trump -- the first time a sitting US leader has met with a member of the Kim dynasty. Trump is expected to meet with the North Korean despot before the end of May. In the surest sign yet that Kim is intent on engaging in international talks, the North Korean leader made his first foreign trip as leader to Beijing this week to meet with Chinese President Xi Jinping. The trip was in part an effort to mend an old alliance which has been strained in recent years. During his China trip, Kim again stated he wanted to "resolve" the issue of denuclearization on the Korean Peninsula, according to Chinese state media. On Thursday, high-ranking Chinese diplomat and Politburo member Yang Jiechi arrived in Seoul to brief South Korean officials on the North Korean leader's visit to Beijing. Kevin Rudd, former Australian Prime Minister and Asia Society Policy Institute President, told CNN there had been a wide misreading of Kim's statements on denuclearization. "North Korean negotiating posture has one core objective, which is regime survival, and having spent the last 25 years acquiring nuclear deterrent it is hard to believe that the North Koreans are prepared to give that up," he said. "This language (of denuclearization) is not new, it's been around for quite a long time, and the core point is its highly conditional." Japanese Prime Minister Shinzo Abe is expected to meet with Trump in Florida in April, ahead of any potential meeting with Kim, likely with a list of concerns over the potential face-to-face encounter. 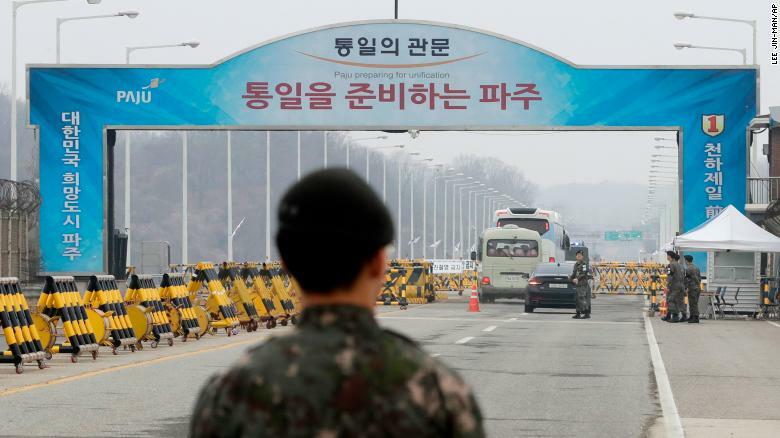 South Korean soldiers stand as vehicles carrying a South Korean delegation pass the Unification Bridge, which leads to the Panmunjom in the Demilitarized Zone, South Korea, Thursday, March 29. 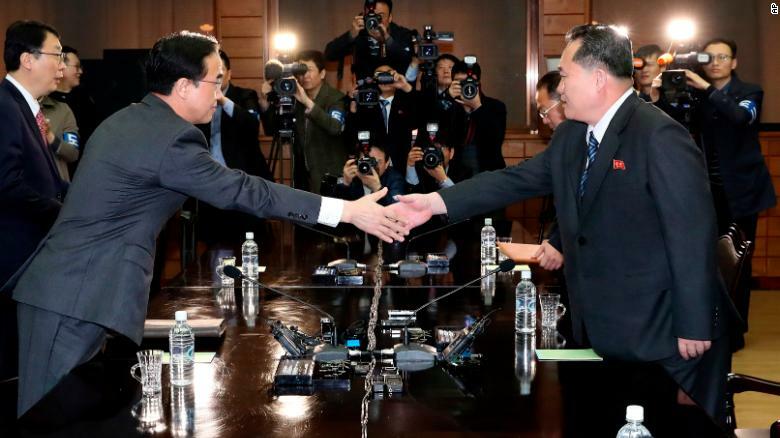 Thursday's North and South Korean delegations were both headed by the same men who engaged in the first negotiations in January, after Pyongyang agreed to reopen diplomatic communications with Seoul. Ri Son Gwon, chairman of Pyongyang's "Committee for the Peaceful Reunification of the Country" led the North Korean delegation while Unification Minister Cho Myoung-gyon represented Seoul. Talks between the two sides began at Tongil-gak, the northern side of Panmunjom, in the highly fortified DMZ shortly after 10 a.m. local time, wrapping up in the early afternoon.